Looking for the Wednesday Wandering? Just page back one for another look at the complexities of characterization. Then join me and Alan as we begin a look at the absorbing topic of stuff and where you put it. JANE: Alan, I enjoyed your most recent “wot I red on my hols” column (http://www.tyke.net.nz/wotired/holidays188.htm), but when you said that bit about how you and Robin had a big “clear out” and have “taken heaps of rubbish to the tip” you deliberately talked “British,” didn’t you? ALAN: It wasn’t deliberately British. I was just saying what comes naturally and I was a little taken aback to find that the words were so strange to you. It just goes to show that we’re never going to run out of material for these Tangents. Something always pops up. Okay, let me try some interpretation. “Tip” is “dump,” right? And, while we’re more likely to use “garbage” than “rubbish,” I get that one. But having a clear out? That’s just weird. ALAN: OK — let’s start with “clear out” since that one puzzled you the most. All it means is that we went through every room and looked in every cupboard to decide what was worth keeping and what wasn’t. So we “cleared out” the stuff we didn’t want. There’s another interesting thing that came up in your explanation. You spoke of emptying out “cupboards.” I automatically “translated” that to “cabinets.” It’s not that the word “cupboard” isn’t used here but, at least where I have lived, “cabinet” is much more common. ALAN: Oh no – cabinets are quite different from cupboards. Generally speaking cabinets are glass fronted and they are used for displaying your collections of Wedgewood pottery and Georgian silver to visitors. My grandmother had a china cabinet of which she was extremely proud. JANE: Let’s see… We’d call those glass-fronted thingies either “display cases” or “display cabinets.” This past weekend, Jim and I were in a hardware store. Someday we plan to replace our kitchen cabinets (cupboards, to you) and so I always look wistfully at the displays. I noticed that many of the higher end models featured glassed in fronts. These looked very stylish, but I found myself thinking that I wouldn’t want them in my kitchen. We don’t quite go as far as Lovecraftian storage, but certainly the varied assortment of things we keep in some cabinets wouldn’t look very artistic if put on display. So, what would you call a glass-fronted kitchen cupboard? Would it become a cabinet by virtue of the glass? ALAN: Now there’s a conundrum. I’m not sure such things even exist (I don’t recall ever seeing them). Actually I rather hope they don’t exist, because I have absolutely no idea what to call them! JANE: Returning to cupboards… I noticed in your account of clearing out, you mentioned a cupboard under the stairs. From the amount of stuff you had in there, I suspect an American would have called that a “closet.” In light of Harry Potter’s residency in such a place, this is an interesting point. How large is your cupboard under the stairs? ALAN: I always thought a closet was a place where you hung clothes? We’d call that a wardrobe… But from what you say, obviously a closet can be more than just a wardrobe. JANE: Ah, hah! We had a storage areas like that in the houses in which I grew up (my current house doesn’t have any staircases) but these were still called “closets.” They were simply bigger closets with weird space, so that small boxes went in the back and larger in the front. I hope Ashleigh had fun. You and Robin are really very nice. Going back to wardrobes… In American usage, the word is becoming archaic. Where it is still in active use is when it is applied to freestanding furniture that serves as a closet (in this usage, meaning a storage place for clothing). The first house I owned was in Virginia. It was built before the American Civil War and had no closets. (It was short of cupboards and cabinets as well.) Therefore, it became necessary to go out and buy furniture in which to hang clothing. This was a nuisance and eventually one of the rooms in the house became a sort of gigantic closet. If I had stayed there, I would have built in clothes closets and probably cabinets and cupboards. All the rooms were very large and one would hardly have noticed the loss of space. ALAN: Very sensible of you. But if wardrobes are falling into disfavour, however do you manage to visit Narnia for your summer vacation? JANE: Closets work just as well as wardrobes for Narnia visits. The problem is finding the right sort of wood to build into the structure. I loved that detail in the books. It made the transport so perfectly reasonable! That’s my favorite sort of fantasy, where there’s a reason, no matter how odd, for what happens. Meanwhile, we’ve still got tips and dumps, rubbish and garbage, and other gnarly things to explore. Let’s carry on with this next week! This entry was posted on March 20, 2014 at 1:00 am and is filed under Thursday Tangents. You can follow any responses to this entry through the RSS 2.0 feed. You can leave a response, or trackback from your own site. Like most Canadians, I’m bilingual – I understand both English and American – so I always enjoy relaxing on the chesterfield and watching the conversation (hint: check the Wikipedia disambiguation page). For an interesting graphical view of regional variations in US English, see http://www.popvssoda.com/, which maps local usages of what to call a carbonated soft drink. Or if you prefer a cross-dialectal discussion of whether or not a weekend qualifies as a surface, see http://languagelog.ldc.upenn.edu/nll/?p=10702. (Yes, I’m a recovering linguistics geek). Fun! I keep wondering about the derivation of cupboard (cup+board) and closet (what’s closed off? Does a closet need a door or not?). It’s one of those things. Perhaps separate wardrobes went out of fashion when houses started being built with storage spaces (closets to us). We even have a closet in our kitchen that we call a pantry, although it’s a very small one. From a pure moving perspective, wardrobes do have a problem: moving them. Given a choice between carrying boxes of clothes up to a closet and heaving a wardrobe up the stairs before carrying the clothes up, I’d rather have a closet actually. 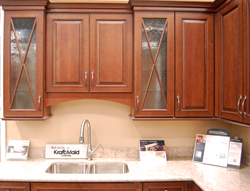 As for glass-fronted kitchen cabinets…oy. Living in earthquake country as I do, I see those darned things as disasters waiting to happen. Still, some people like to show off their stuff, I guess. For cupboard, the original definition derives from the old use of board for ‘table’: “a. A ‘board’ or table to place cups and other vessels, etc. on; a piece of furniture for the display of plate; a sideboard, buffet.” Our current usage seems to have developed in the mid-16th century, but the older one survived at least until the beginning of the 18th. A closet was originally a private chamber or, eventually, side chamber, so what was being closed off was the personal space of the owner of the palace or castle. So, it does need a doorway, but that could be quite effectively blocked by a door, hanging, burly man-at-arms or any combination thereof that seemed appropriate. For “closet” — remember the scene in Gertrude’s “closet”? Small, private room, complete with curtained arras. All quite rational, of course: when they added a second floor to the house side, the only good place for the staircase was in front of what originally was the door to the business side. So that’s where it went, with a nicely-fitted door under it leading to the other half. That’s cool — and talk about liminal space! Can space under the stairs, no matter how large, be a proper room or not?